Mike Pence has spent his entire career in politics trying to oppress LGBTQ people, but now he’s saying that he’s really the victim of religious oppression from South Bend mayor and out presidential candidate Pete Buttigieg. Pence even went so far as to take credit for implementing marriage equality in Indiana… after the Supreme Court ordered him to do so. Appearing on CNBC’s Squawk Box, Pence was asked about Buttigieg’s criticism of his homophobia. “He said some things that are critical of my Christian faith and about me personally, and he knows better,” Pence told host Joe Kernen. Related: Deluded gay Republican says it’s a ‘lie’ to call Mike Pence homophobic. Here’s the truth. 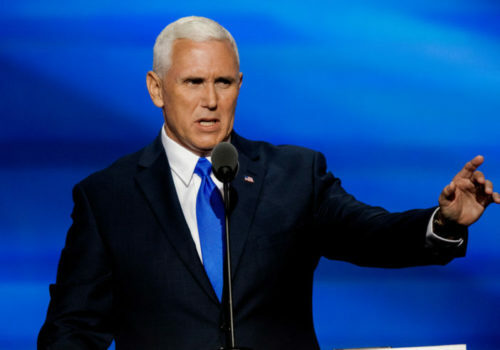 Pence stressed that he and Buttigieg had a “great working relationship” and, like his wife Karen Pence, he suggested that Buttigieg is only attacking his homophobia because Buttigieg wants to stand out in the Democratic primary. Kernen pressed Pence on his views, asking him if he has changed his opinions on marriage equality or LGBTQ rights in general. “When I was governor of Indiana, we fully implemented” the Supreme Court’s decision in Obergefell v. Hodges, Pence responded. Ever since he first successfully ran for Congress two decades ago, Pence has opposed LGBTQ equality consistently. He voted for a constitutional amendment to ban marriage equality, he voted against ending the law that banned gay people from serving in the military, he voted against anti-discrimination legislation and hate crimes legislation, and he even suggested conversion therapy as a way to fight HIV. As Indiana’s governor, he repeatedly blocked hate crimes legislation, criticized court decisions that granted LGBTQ people rights, and pushed for a religious exemptions law that he refused to say wouldn’t legalize discrimination against LGBTQ people. And as Vice President, he has been a key supporter of the transgender military ban and has spoken at anti-LGBTQ hate group meetings. Even though all of these actions made LGBTQ people’s lives worse, he contends that he is hating the sin, not the sinner, that if he says he is following his religious beliefs then he cannot be criticized, that if he is polite to individual LGBTQ people when he meets them then his attacks on an entire class of human beings don’t matter since most people only notice those superficial interactions.